Sorry Guerlain, but Chanel wins this round. 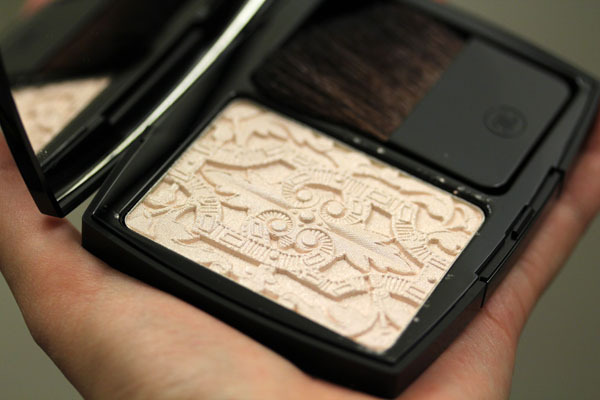 Lumière Sculpteé de Chanel is the centerpiece of the Les Scintillances de Chanel Holiday 2011 Collection. 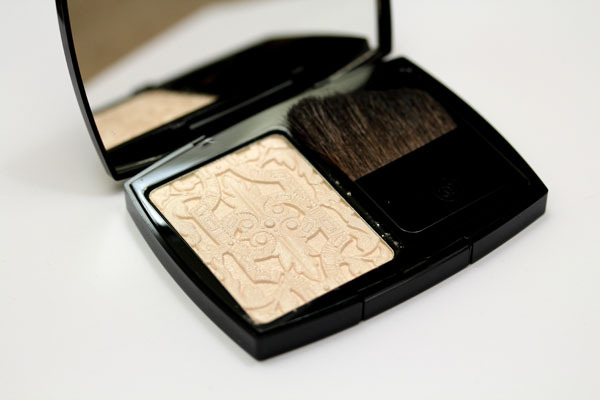 The intricate high relief design aside, Lumière Sculpteé de Chanel is a great white gold highlighter. Those who lamented the lack of pigmentation in Guerlain Parure de Nuit can gleefully swipe their brushes over this prettiness and see a more pronounced effect. At least, in the hand swatch. On the face, you get the soft glow the best of highlighters provide. 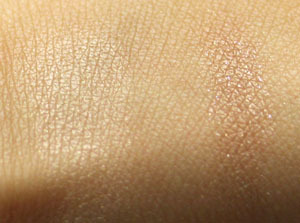 The texture of the palette itself is buttery soft. When I touch it, it's almost like touching marshmallows, but not as squishy, if you know what I mean. 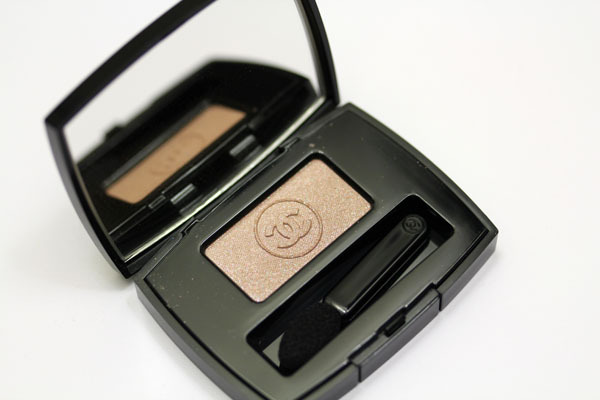 I cannot stress how easy it is to pick up pigment from Lumière Sculpteé de Chanel. Just lightly press any brush to its surface and there it is. In the picture above, I applied Joues Contraste Tempting Beige to my cheeks and swiped Lumière Sculpteé de Chanel above it to highlight. 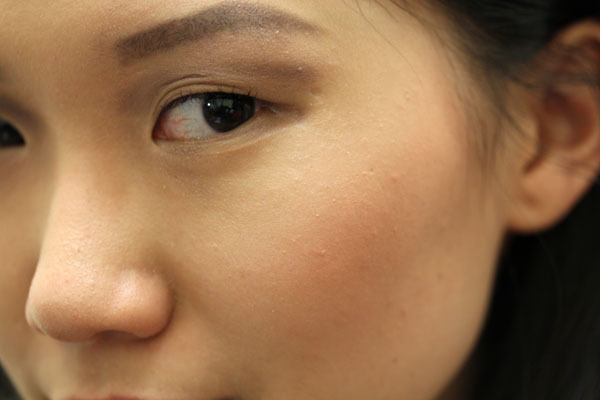 I also applied a little of the highlighter to the area below my brow. I'm also wearing Beige Lamé in the picture, but you wouldn't be able to see it. Beige Lamé is the exact color of my lids with a smattering of pink and blue glitter. I don't know why I like it even when it doesn't show up on me, but I really do. Though in terms of functionality, I guess people who are less yellow will get more use out of it. 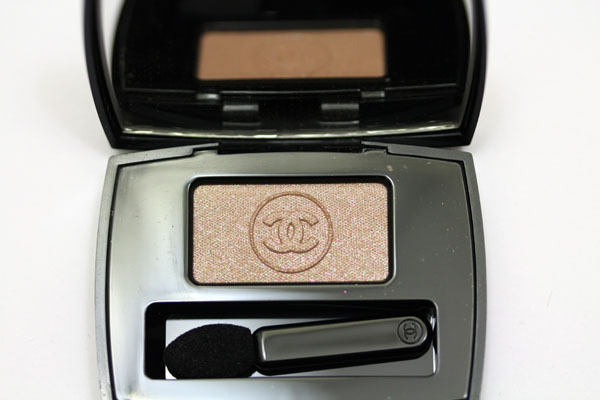 The Chanel Holiday 2011 collection features a bevy of other products, including some other eyeshadows, a blush, a loose powder, two Glossimers, two Rouge Allures, one Rouge Allure Laque, one Rouge Allure Extrait de Gloss and a gold liquid liner. I didn't purchase any of the lip products because none of them clutched at me and made me take them home. I thought Triomphal and Famous (the gloss and RA) were splendid reds based on the promo pictures, but they turned out to have a pinkish tint, which I didn't like. RAL Empire made my lips look chapped - a pity, since I'm a huge fan of the RAL formula. I would have loved Brun Rose if it swatched true to pan, but it turned out to be peachy on the skin. Pretty, but not really what I was looking for. Lumière Sculpteé de Chanel and Beige Lamé retail for $72 and $28.50 respectively and are now available at Chanel counters, boutiques, and online at chanel.com. Items from this collection may be something you'll want to run out to get. Since it's been around for a week, I can imagine half the counters to be sold out of the highlighter palette already. Too bad Empire made your lips look chapped! I'm going to hunt it down at my Chanel counter; I hope we already have it here. If I don't end up liking Empire, I think I'll just take Dragon RAL home. When I saw you wear that I just died. Died. Oh, Lumiere is so beautiful! @Joey aww, but yay also! Yet more gorgeous close-ups! 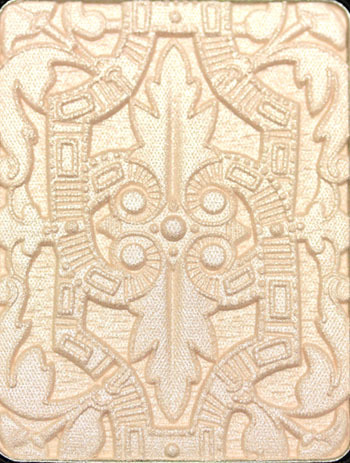 : ) I opened up my Lumiere Sculptee today, and marveled at the artistry. I was surprised to find it wasn't entirely ivory; none of the swatches I have seen online were able to capture the pink-beige tones. Absolutely beautiful. Regarding Tweed Brun Rose, I had the same reaction to you. Are there any Tweeds you like and own? I think Rose would suit me best. Was waiting for your response! :) What else did you get from Chanel Holiday? I don't own any of the tweeds. I have a number of JCs though. Orchid Rose is really pretty! I made my choices based on Best Things in Beauty's swatches. I got everything you did, plus Famous and Triomphal. I haven't swatched them yet, but I figure pink reds look good on me. I have an appointment with Lloyd Cassler at the Mazza Saks Chanel counter this weekend, so I may be picking up more. The Noir-Ivoire eyeshadow duo in particular has my attention. Holiday collections are so much fun! Do you think the Guerlain Parure de Nuit is more of a finishing powder and less of a highlighter? If you swirl your brush over all the colors and apply to your entire face, does it give you that "Meteorites" look? I have (and love) this Chanel one, but I can't stop thinking about the Guerlain! I think Parure de Nuit is comparable to the finish you get from the permanent Meteorites (like Teint Beige, which I own), though PdN might contain a little more shimmer. PdN is less obvious of a highlighter when compared to items like Lumiere Sculptee, but some might like it precisely for how subtly it lights up the face. If you've always been using your Meteorites as finishing powder then you'll definitely be able to do so with Parure de Nuit. I am sorry I can hardly see it on your face. I tested it om my own skin and it did not show up either and I have a lighter skin. I just do not think this Chanel product is worth the price. I understand :) Highlighters are notoriously hard to photograph to show on the face. I've heard other feedback from people saying the highlighter doesn't show up on them as well (whereas others rave about it). When seen in the hand swatch the powder is a shade or two lighter than my skintone, perhaps that's why it shows up on me whereas it might blend into your skin instead? Another example I can give is Beige Lame. While I love the color it really doesn't show up on my eyes. However, when I see it on lighter skinned girls they look fantastic (and I get so jealous because I want to see that on *my* eyes).